When Addie said that the only socks that keep her toes warm are the socks Granny makes, I got busy making another pair for her. Her socks were made from the leftovers rom my socks. I doubt I get any more made for her before I go but I’ll pull out some sock yarn, wind it and take it there and I can make more while I’m there. 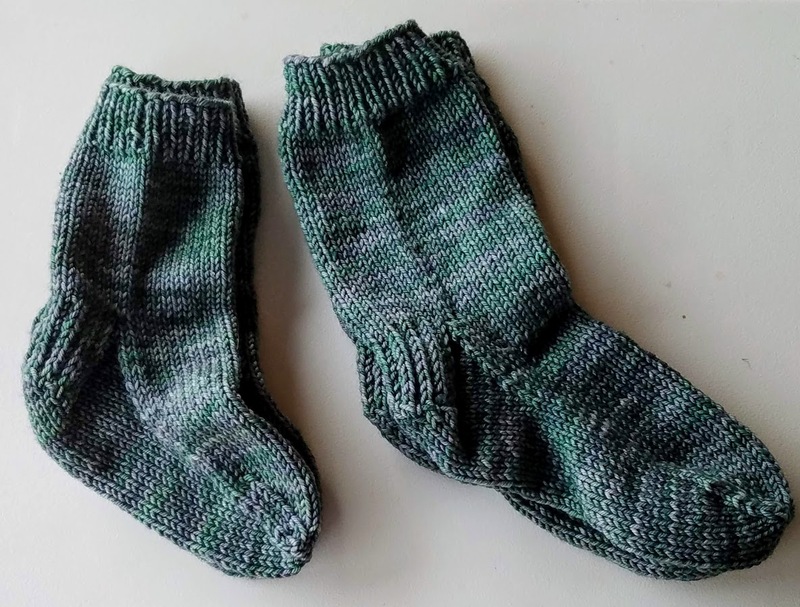 These are worsted weight so they went together quickly. Hi Judy! I love when you post socks!!!! I am with addie! I love my wool socks my friend makes for me. It doesn’t get that cold where i live (mesa, AZ). But it’s cold to me andpretty wool socks are the best!!!! I am a very beginner in knitting. VERY! Is there a basic pattern that would be good bet beginners. Also, what yarn? I can crochet, but knitting looks finer. Thanks for any help you can give. Would taking a class be better? How great to have socks that match granny’s! Love the matching socks. Love the fact that Addie noticed the difference in socks. Since I do not knit I have just tried Bomba’s and they are warm and feel wonderful.